Is National Security supposed to be armed? Very often, we see armed men who describe themselves or are described as “National Security”. In recent times, too, we have seen contingents of such armed men in clothes marked “NSC” – ostensibly, National Security Council. These men do not only carry guns around, they also carry out a wide range of activities akin to those carried out by the standing security agencies like the Police Services, the Armed Forces, the Bureau of National Investigation (BNI), the Research Department (RD), etc. They stop, search, arrest and detain individuals as they move along. The Constitution establishes the National Security Council (NSC). It also provides for the NSC’s composition – not less than 20 persons. The President chairs the NSC. He directly appoints the three non-ex officio members of the NSC. He also appoints the ex officio members but only indirectly. The ex officio members include the ministers for foreign affairs, defence, interior, and finance. Three chiefs from the Armed Forces (including the Chief of Defence Staff), three persons from the Police Service (including the IGP and the CID boss), the Customs boss and the head of the Prisons Service. The rest are the Military Intelligence (MI) boss, the BNI boss and the RD boss. What does the NSC do? This is exactly where the difficulty of our “National Security” men begins. We will find out if what they do – arresting people and using arms to control the public – fall within the powers granted to the NSC under law. Under the Constitution, the principal function of the NSC is to take “appropriate measures to safeguard the internal and external security of Ghana.” They are also responsible for “ensuring the collection” of intelligence (internal or external), assessing our military might and making it ready for and responsive to our national security needs. Other countries, too, have their NSCs with similar structure and composition, who perform such functions. All these functions require the coordination of the activities of all the standing security agencies – Police Service, the Armed Forces, the Bureau of National Investigation (BNI), the Research Department (RD), etc – the exact reason the bosses of the standing security agencies are on the NSC. To be able to carry out this function (of coordinating the activities of the security agencies), the law establishes the Office of the National Security Coordinator. It, then, attempts to replicate the NSC at the regional and the district levels – the regional security council (REGSEC) and the district security council (DISEC), each with representation from the security agencies at those levels and two non-ex officio members appointed by the Regional Minister and District Chief Executive respectively. The National Security Coordinator has staff in her office. The law classifies her staff into two – those whom the President employs for her (civilians) and those who are on secondment from other agencies. This bifurcation serves two purposes: First, it is an admission that the Coordinator’s office, not being a security agency, may require special expertise from the standing security agencies for some limited functions. But it is also a loud acknowledgement that the Coordinator’s office cannot arm or be empowered to arm its staff or authorised to control the public. We may glean two things from the very composition, functions and the structure of the NSC. First, that the NSC is a strategic or policy body. And, second, that the NSC is not a tactical body. This is also obvious from the fact that the Constitution endows it with no standing armed force or the power to raise one which will perform any tactical activities – arrest, detention, public control, etc. By the relevant law, it is only two additional agencies that may arrest or use arms to control the public. They are the BNI and the RD. Even that, the BNI and RD bosses or designated officials always need a warrant from either a senior police officer (Superintendent or above) or a Justice of the Superior Courts. Further, the Constitution, for good reasons, expressly controls the establishment of such a tactical security agency. It says that “no agency, establishment or other organisation concerned with national security shall be established except as provided for under this Constitution.” The jurisprudence behind this constitutional control is also common sense as it is an experience – the framers of the Constitution very well know the danger in allowing the President or his appointees to arm people outside the standing security agencies. 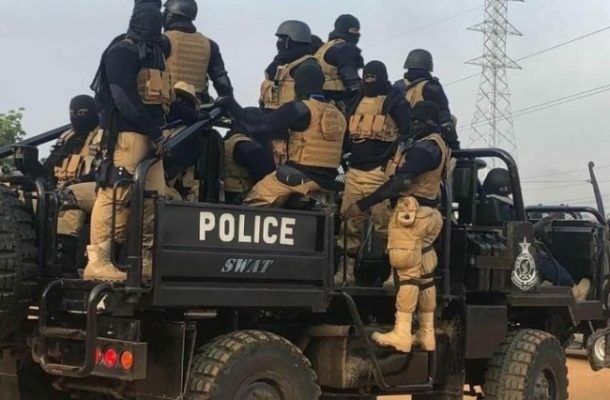 ￼These unmarked bandit-masked men were seen in a Police SWAT truck during the Ayawaso West Wuogon by-election. Indeed, allowing the NSC to arm its employees and authorise them to arrest citizens (as it seems to be the case) not only violates the functions and power scope of the NSC, it also violate the constitutional prohibition that “no person or authority shall raise any police service except by or under the authority of an Act of Parliament” and also that “no person shall raise an armed force except by or under the authority of an Act of Parliament”. Even as the relevant authorities begin to investigate the incidents that marred the Ayawaso West Wuogon by-elections, let us not lose sight of the fact that major civil wars often begin with an innocuous breach of some a seemingly insignificant law somewhere.